Its peppery taste wasn’t too overwhelming. Not too spicy, the dish wasn’t too wet, too. Simply an exotic restaurant-dish to be made at home, easily! 1) Use a pair of kitchen shears to cut a slit at the back of each prawn. Remove vein, followed by removing shell with its head and tail remained intact. Repeat step till all prawns are done. 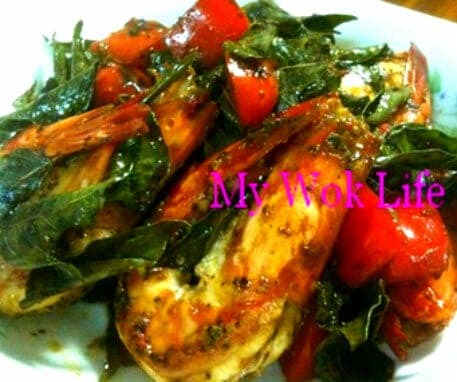 2) Season prawns with chicken granule, black pepper, for 10 minutes. 3) Heat wok with olive oil over medium fire. Melt butter in heated wok. Add garlic, onion and curry leaves. 4) Sprinkle some potato starch on the seasoned prawns. 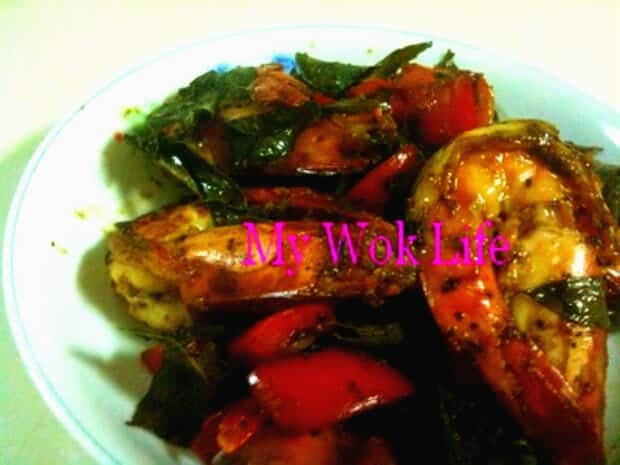 Place prawns in wok in one layer to slightly sauté both sides of each prawn. Add capsicum and stir fry to combine, for 2 minutes. 5) Add black pepper sauce and stir fry to combine well, for another 1 – 2 minutes. Heat off and dish up. Serve with steamed butter rice or olive oiled spaghetti. 1 portion (about 3-4 pcs) of my black pepper prawn counts about 300kcal. **A variation of my Black Pepper Pork Slices dish. Tips: Add assorted capsicums to the dish to create an image of playful colors. Do you happen to know whether thick bee hoon has more calories than thin bee hoon? And compared to kueh teow/mee pok/mee kia etc? I can’t seem to find these on the internet and you seem to know a lot about nutrition so I thought I’d ask you. Thanks! I guess it’s way too late of my reply with no excuses.. I simply missed out your comment, actually. Hi. Can you recommend the brand for black pepper sauce for this dish? Hi! Can you recommend the brand of black pepper sauce to use? Please try Woh Hup brand which comes in glass bottle and it’s available at major supermarkets eg NTUC Fairprice, Shop n Save, etc. Love your blog! 2016, and I still came across this blog of yours… I was just wondering when do you put the cooking oil for this recipe? Step 3 stated heat olive oil, but I don’t see any steps mentioning to add in the 2 tbsp of cooking oil as mentioned in the ingredients. Help? Hi Sue, thanks for loving my blog! Haha.. You are right. Let’s do without the cooking oil. Thanks, again, for pointing out. I shall cook this again and update, if any changes ya!